1967 Cadillac Superior Royale Tiara Limousine Funeral Coach "Elvira"
In 1967 Cadillac shipped 2,333 Series 69890 commercial chassis (featuring a 156" wheelbase and a perimeter-type frame) to the three major US funeral car and ambulance manufacturers. The cost of these was approximately $3,500 and industry leader Superior Coach of Lima, Ohio bought 1100 of them, delivering 20 funeral flower cars, 300 ambulances, 406 combination cars and 374 funeral cars. Styling of the Cadillac commercial chassis was compatible with that of their passenger cars, and it was not uncommon for larger funeral directors to operate sizeable fleets of matching Cadillac hearses, limousines, flower cars, and an ambulance or two. There were 4 series in the Superior model lineup for 1967. Royale, Crown Royale, Sovereign and Crown Sovereign. Within the Royale and Sovereign series there were two limousine styles each, and one landau. The Crowns were available in limousine or landau styles. Elvira (body no. 923 and model no. 604) is one of 256 end-loaders built in 1967. She is actually a step up from the base model, in that instead of being a Royale, she is a Royale Tiara Limousine (note the tiara molding at the D pillar) and cost $11,360. 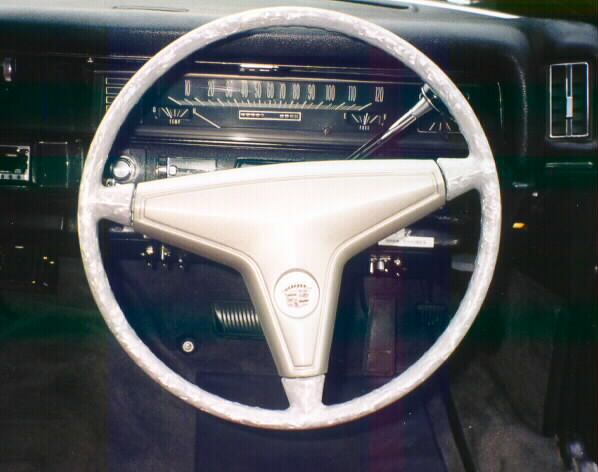 Researchers belonging to the Professional Car Society estimate about 45-65 of this particular model were built in 1967. Probably not too many still survive. The formal drapes were a no cost option in lieu of the standard airliner drapes. Originally there were drapes across the rear window too, but these have been removed for better visibility. Elvira was first owned by a Jewish funeral home in New Jersey. Early in 1968 with just 6,000 miles on her, she was sold to the Eggen & Lance Mortuary of 1540 Mendocino Av, Santa Rosa, California who drove her cross country to her new home. She remained there in loyal and faithful service for nearly 30 years until she was sold in late 1997, as she was considered to be too old. Apparently as a protest to her leaving, she required a jump-start and quick charge to begin her last great journey. Imported to Australia by Sutherlands American Car Sales of Carrara, Queensland, she was converted to right hand drive in August 1998 and eventually sold to myself in October 1999. In December 2000, Elvira was finally retired from the funeral business! During her 30 year career she carried many thousands of persons to their final resting place. 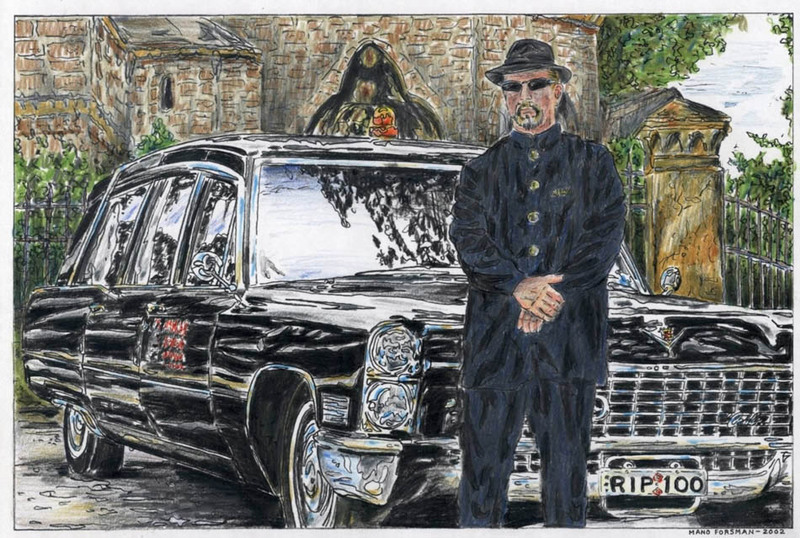 Since being converted to a limousine in 2001, Elvira has been seen every night cruising the dark, lonely and forgotten streets of Sydney doing her Weird Sydney Ghost and History Tours, and has gained quite a reputation for being the world's most haunted hearse. Click on the Destiny Tours logo for more details. NEW: A beautiful drawing of Allan and Elvira, by Mano Forsman. Thank you Mano!